Today has been my day off and I have spent it cleansing the flat and myself ready for a healthy few weeks ahead- unbelievably I am having an alcohol free August!!! And I am starting tonight! I am going to be filled with energy and vitality in no time at all, or that’s the plan…. Colin is at his stocktake so Tonight’s dinner has been a delicious salad, which I can not rave about enough. drain the mandarins over a bowl. To the juice add the sesame oil and rice wine vinegar and whisk together. 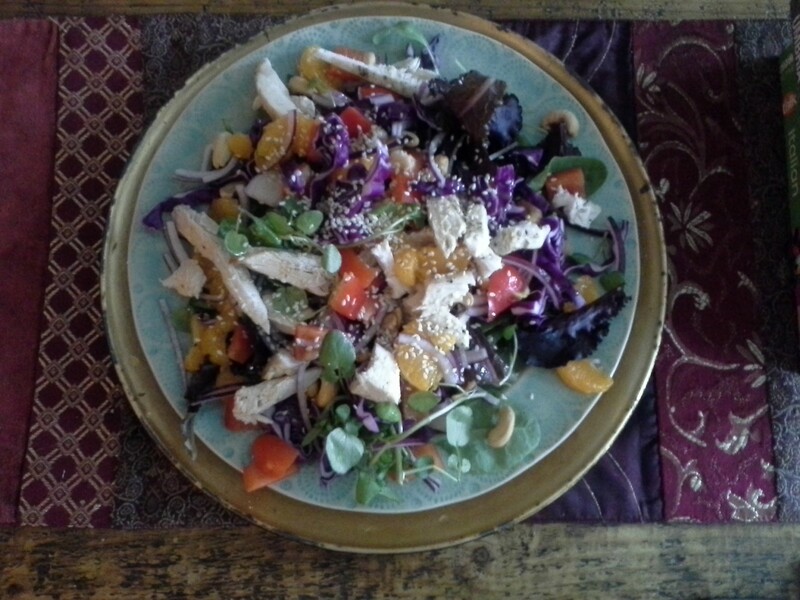 on a large plate place the watercress, red cabbage, red pepper, red onion, chicken, mandarins and cashews. Sprinkle over the sesame seeds. drizzle over the dressing and serve immediately. I have made enough for my lunch on my late night at work tomorrow and I can’t wait for it. 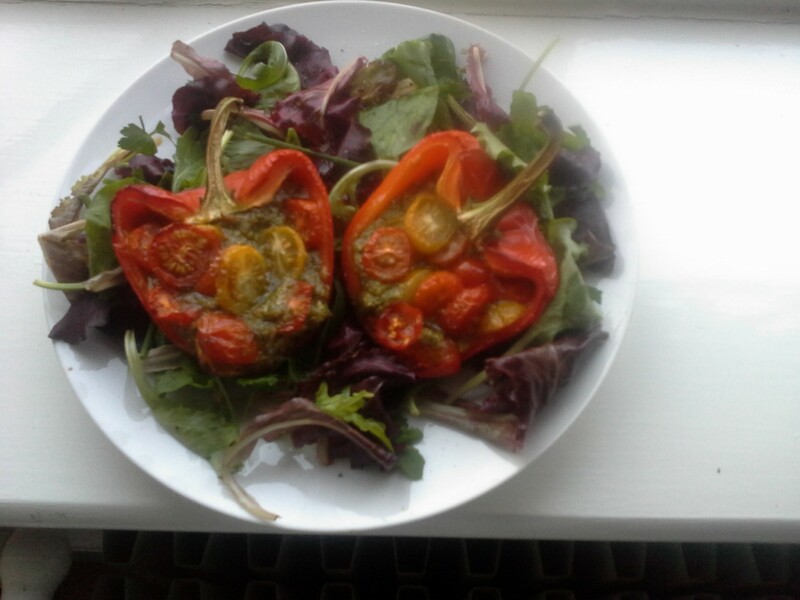 Massively filling and tasty, and super healthy! 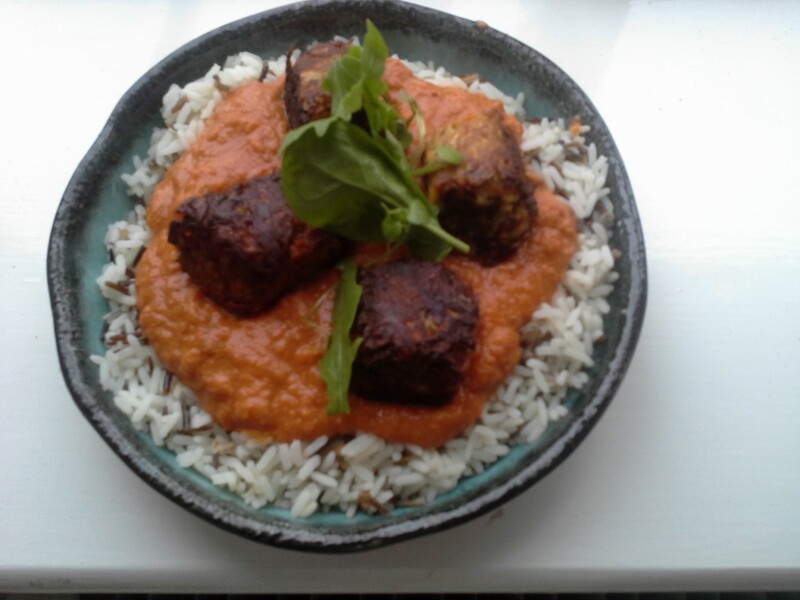 For dinner last night we had some spicy lamb meatballs with a tomato sauce. A really relaxing weekend, which was really needed after a long week. On Saturday we had to stay in to wait for a man from BT to install BT Infinity- only really being done to make sure we can get BT Sport from next week!!! 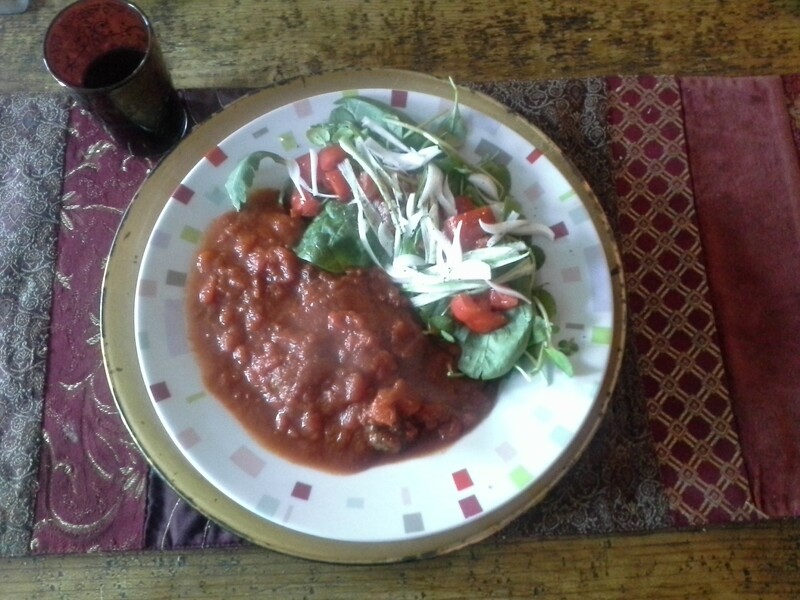 Although being a Newcastle Utd supporter I probably will not want to be watching the football when the season starts up…..
For lunch we had a little bowl of pasta- tomatoey, garlicky and full of chilli, really yummy. 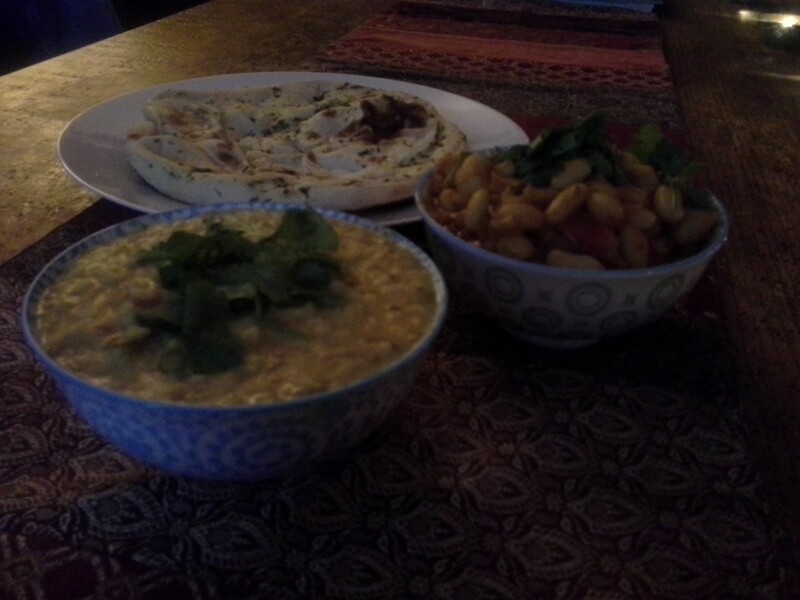 For dinner I made some Indian inspired dishes: a dal, a bean curry and some marinated plaice. The bean curry was an amalgamation of 2 recipes: one for a chickpea curry and one for a red kidney bean curry. 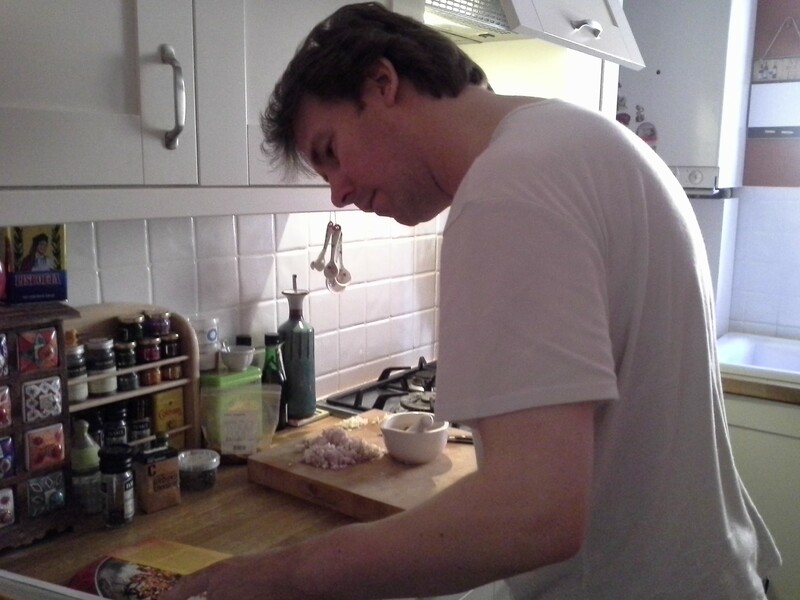 However, I realised that I had bought cannellini beans by mistake so adaptations had to be made….. Actually it was ok! Cannellini beans don’t hold their texture as well as red kidney beans and they did break down a little, but mixed with the dal the flavours worked really well. 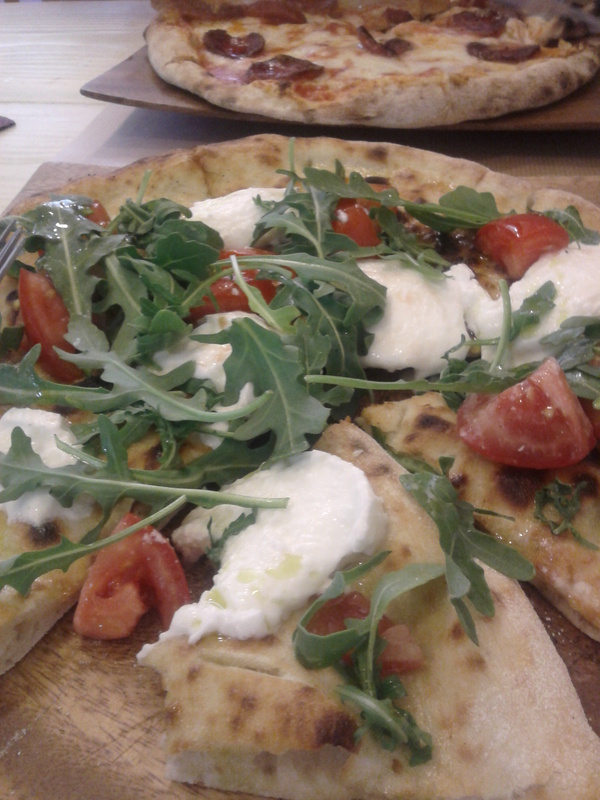 On Sunday we had a lie in and then wandered along to Twickenham, trying Ruben’s Bakehouse for pizza. We have bought bread, particularly sourdough bread, from Rubens many times as it is delicious, and such a good addition to the high street. We noticed that they have opened up a Pizza place next door so thought we’d give it a go. And how pleased we were! 2 pizzas down- spicy pepperoni and a fresh mozzarella, rocket and tomato. We were bursting as we ate way too much, but happy, happy, happy! We’ll be back on a very regular basis. Despite feeling like we would never eat again somehow we managed to find room for a little roast loin of pork (rubbed with bashed fennel seeds, thyme and garlic), salad and some little potatoes. A fitting end to a foodie filled weekend. Happy weekend indeed! When I first started writing this blog I was really good at making sure I got to it everyday. But over the past few weeks I have been easily distracted and it has fallen a bit behind…. so I am going to write up highlights from the past 10days bringing me up to date, then I will endeavour to get back on track! I am blaming the sunshine- making me drink wine and act all sleepy. After a busy, busy day at work I needed no excuse to ring for a takeaway, so dinner came from Minar in Hampton- our new favourite Indian takeaway by far. Absolutely delicious: Tandoori king prawns, dal, Bombay aloo and naan bread. Washed down with freezing cold beers. Today we went to visit Colin’s parents as my lovely niece and nephew, Emily and Toby, were over from Geneva. My left arm is massively aching after an extended swing ball play with Toby- he is much better than me although he was very kind about it with me, and I got to dangle my little toes in the paddling pool. Emily had plans to make everyone a macaroni cheese for dinner- quite The little chef in the making I think! For our dinner I made a chicken chasseur. Heat sauté pan and add the bacon. Stir until the bacon is crispy and the fat is released. Add the chicken and brown on both sides. Add the onion and garlic and stir for 10 mins. Add the mushrooms and stir until lightly browned. Add the thyme. Add the wine and bubble down by 1/3. Add the tomatoes, turn the heat down and simmer for 30mins until the chicken is cooked through and the sauce reduced to a nice saucy consistency. I hadn’t made this for absolutely ages- it may have been last made when I lived in Brussels- as Colin has gone off chicken recently. But empty plates at the end of the meal so all well. My comfort food has been tomatoey pasta, and has been for many, many years now. This is a variation to get more veggies in- ratatouille pasta. Really simple: sauté onion, red pepper, courgette and aubergine, all cubed, in olive oil with a little garlic and salt until golden. Add chilli and chopped tomatoes and simmer until saucy- serve with wholemeal spaghetti. It is really lovely and you feel full yet virtuous afterwards! Late night at work so no dinner for me. Colin had bacon, beans on toast. It is always a worry when Colin decides to cook something new. I have come to realise over the years that the problem lies in the actual reading of the recipe- odd for a man who spends his days in bookshops…. 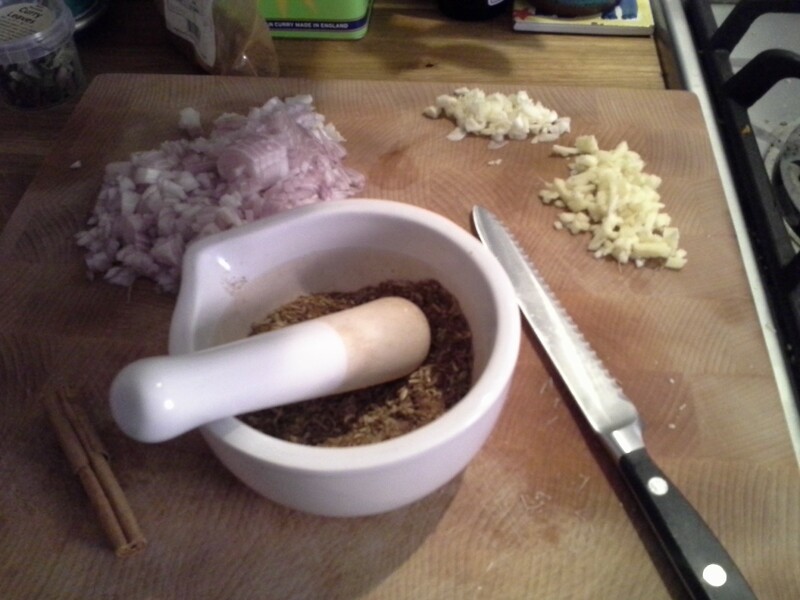 all was going well- smells from the kitchen were good, but the problem became clear- tsp were muddled with tbsp (led to lots of spices…) and 1 litre used instead of 100ml (bit like soup). 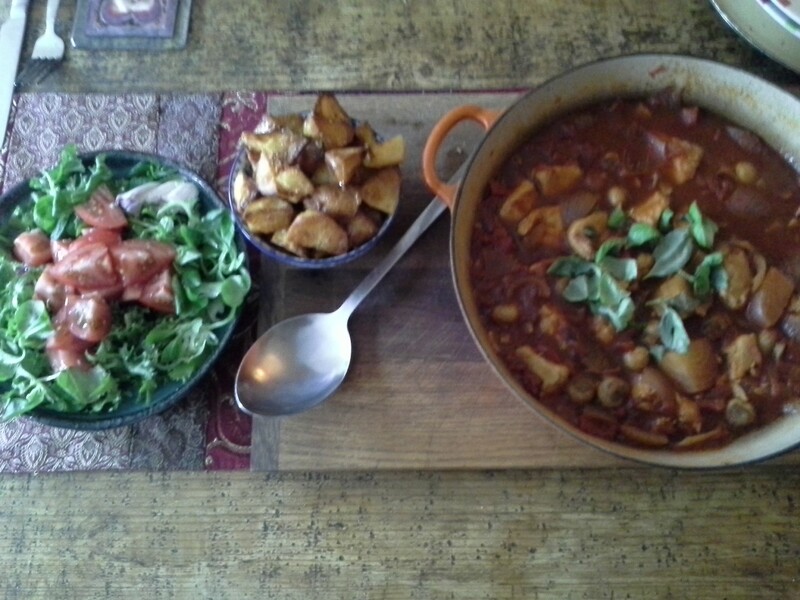 However, reduced down and a tin of tomatoes added made it ok- although my mouth may still be on fire….. next time Colin, read the recipe!!! Here we are at the end of the massive catch up! The week ended with kebab night, one of the favourite nights to be had! Phew, all this talk of food has made me hungry! I’d better go and make dinner! I have actually had to work my 2 late nights at work this week- how horrendous!!! Usually a meeting or something falls on my late, but not this week, but good to get back into a normal routine. 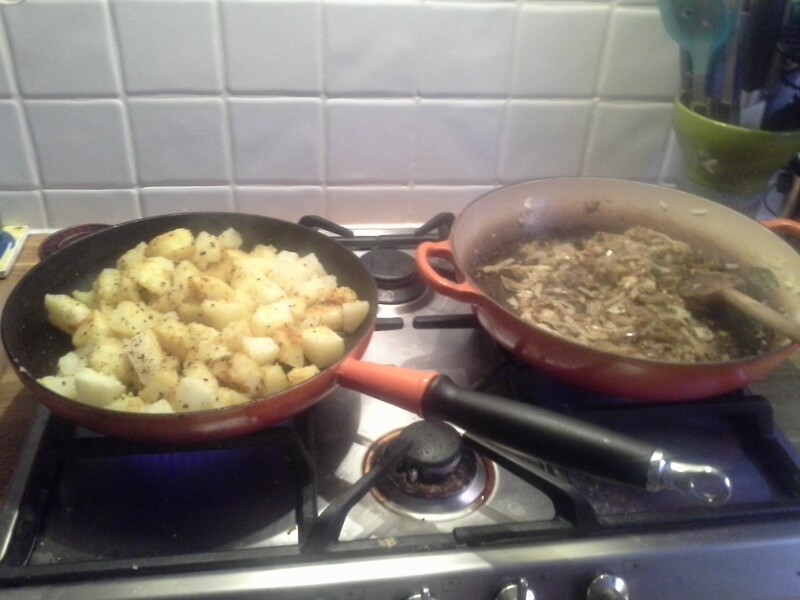 On Monday night we had a very tasty, if a little boring, dinner of pork chops, potatoes and salad. I had got the pork chops from Middle Farm shop and they were massively chunky! I sprinkled them with fennel seeds and grilled them and they filled an empty yum nicely. Tuesday became veggie night instead of Monday…. 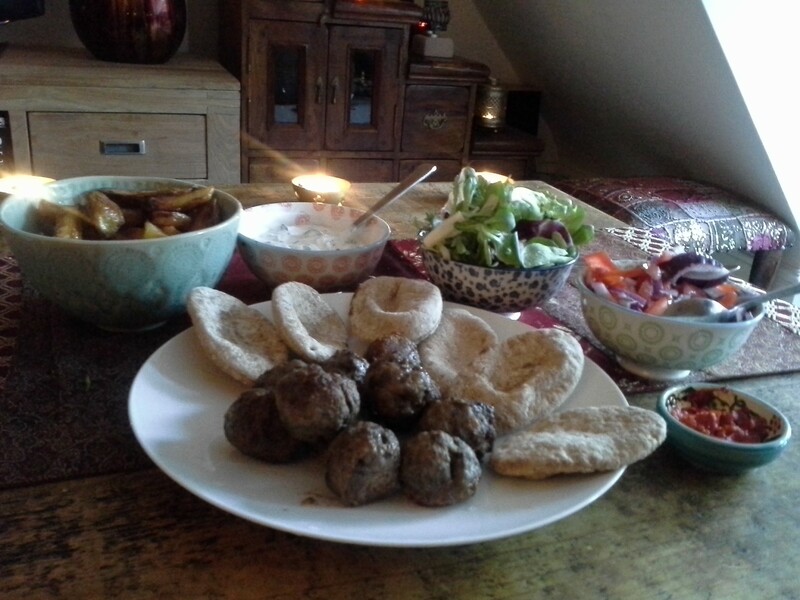 And these not so little balls are made from courgette, onion and chickpea flour. We have them quite often and they only work if you get as much of the water squeezed out of the courgette- which is quite a work out at the end of a busy work day, but a good way to get the stress out!!! Here’s the recipe for the balls and sauce. Thursday night was Pizza night. 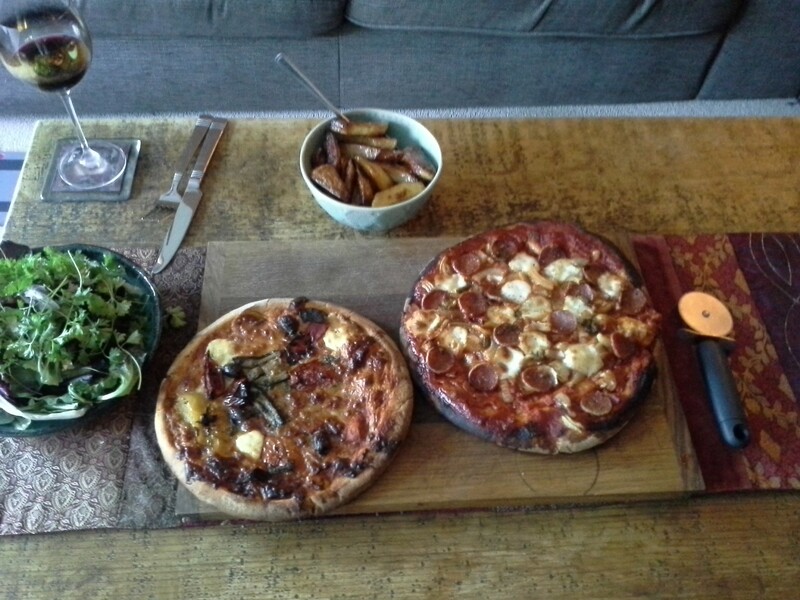 One veggie one (bought), one pepperoni one (made with my own fair hands!). Washed down with good Italian red wine- happiness all round. 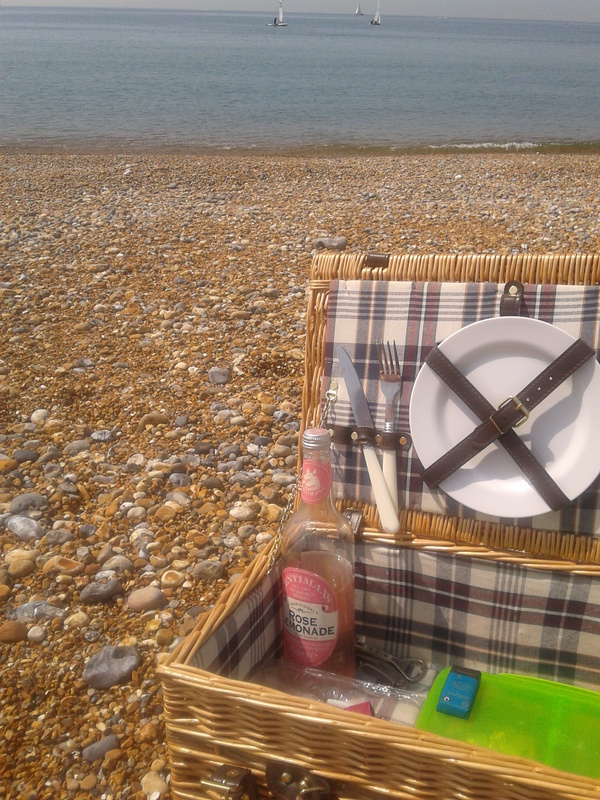 Today we headed south to the coast for a picnic on the beach. We went to a beach at Bishopstone, near Seaford, and it was really lovely- not very busy and lots of little boats bobbing around in the sea. We even stripped off and got in, well me only to the waist as I am a bit of a wimp….. 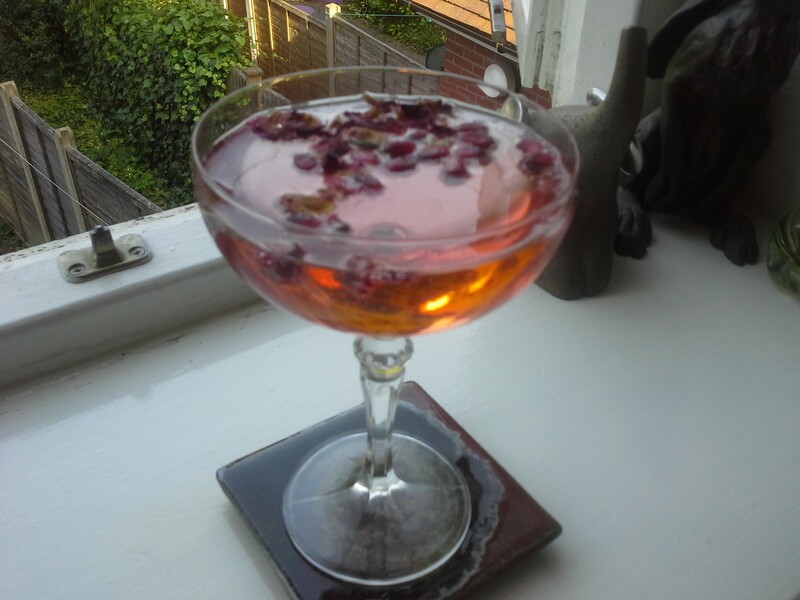 This pink prosecco was decorated with some pomegranate seeds and rose petals, and was fragrant and lovely. It accompanied a spaghetti bolognaise which was delicious, if I say so myself! Yesterday we were also off work and were going to have a picnic in the garden but it was full of little people having a run around! 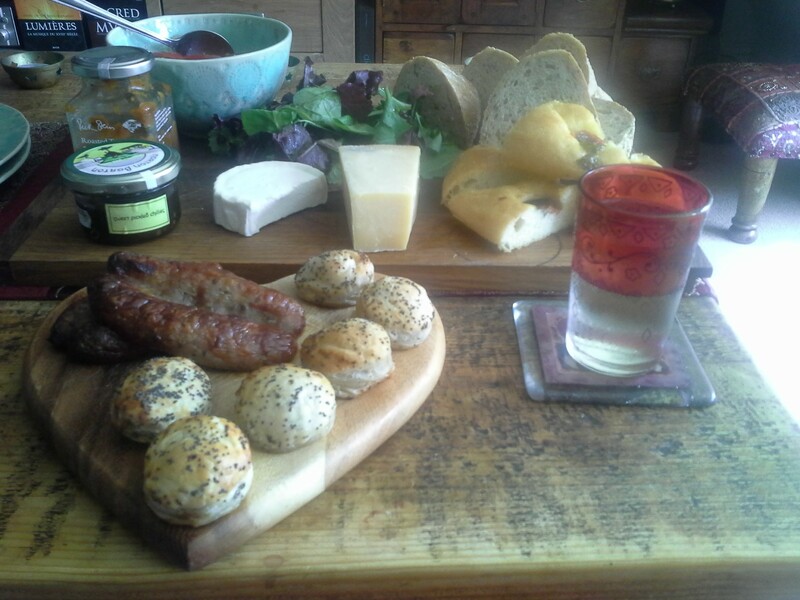 So indoor picnic it was, and actually better than outside as no flies to contend with. The little pastries at the front are some mini beef Wellington from ‘Cook’- I’d not tried them before and they were a winner, I’ll get them in for Christmas for definite. 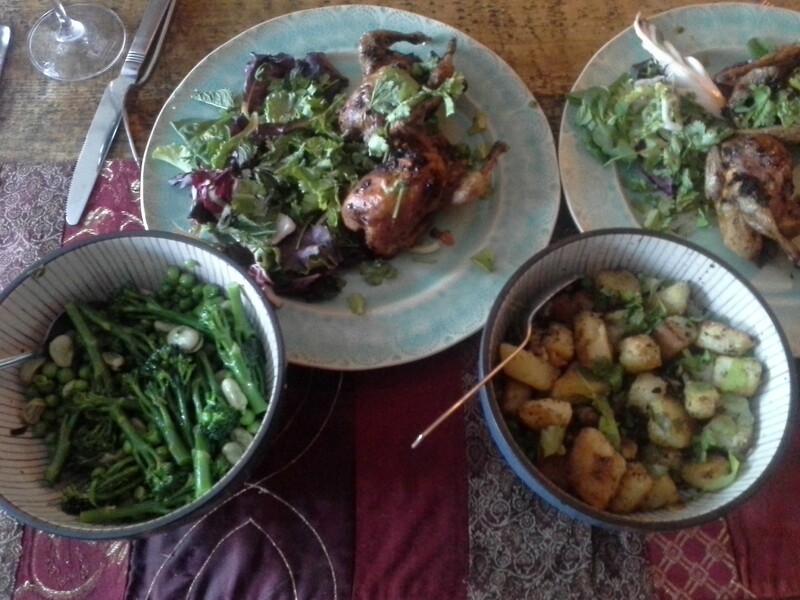 I sprinkled the quail with ras-al-hanout, lemon juice, garlic and coriander. I simply grilled them till crispy and served with some olive oil roasted potatoes and a green bean and broad bean salad. We haven’t had quail for a while which is a shame as we always enjoy them. Maybe they’ll make more of an appearance on our dinner table in the weeks ahead! 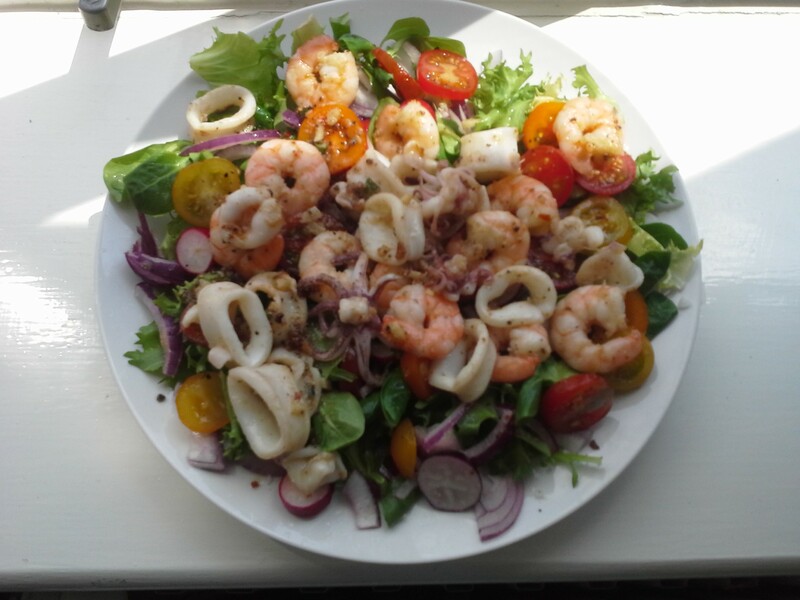 This beautiful seafood salad was fresh and vibrant. I sautéed the squid and prawns in garlic and chilli, with a splash of white wine and lemon juice. I had some multi coloured cherry tomatoes from the farmers market for the salad, alongside some radish, red onion and salad leaves. Delicious! And the yumminess did not stop there! In the evening we wandered along to Hampton in the sunshine and had an Indian meal in Minar. We have had takeaway a few times from Minar so thought we would try it out it to sit in, and how pleased we were as it was absolutely great. The service was spot on, the dining room cool and comfy. But the star of the show is the food- fresh, gorgeously spiced, and not greasy in the slightest. Of course we chose too much food as we wanted to try as much s possible, so with massively full tums we sauntered home. We will definitely be back, and may try their banquet night to try some different dishes to what we would naturally order. Poor Colin is at work and not able to enjoy either the sunshine or the Wimbledon final. I know I should feel guilty, but how can I when the sun is shining and all is well in the world! But I have made sure he has been well fed when back from work. Sunday night I marinated a rib of beef in harissa spices for the afternoon, them roasted it over a high heat, charring it on the outside but staying a little pink in the middle- juicy and delicious. To accompany the spicy meat we had some little new potatoes and a carrot salad from Ottolenghi’s Plenty. A tasty end to my bonus weekend off!